Hot Toys has today revealed the Thor: Ragnarok Cosbaby bobblehead collectible series! 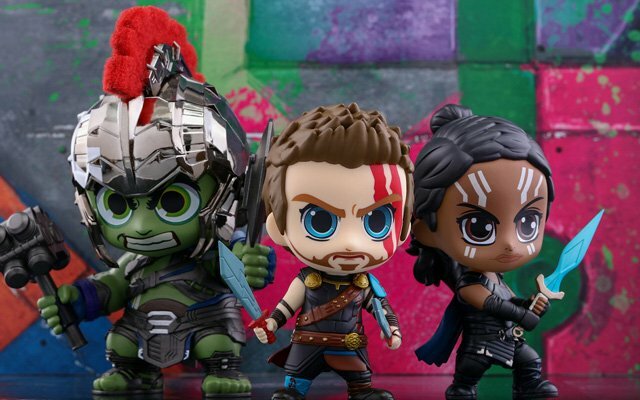 The Thor: Ragnarok Cosbaby series stands about 10.5 – 15cm tall and includes Thor, Roadworn Thor, Gladiator Thor, Gladiator Hulk, Loki, Hela and Valkyrie. Hela and Valkyrie; Gladiator Thor, Gladiator Hulk and Loki’s helmet with metallic finishing are only available in their respective collectible sets! These cute Thor: Ragnarok Cosbaby bobbleheads are armed with their unique weapons and will be available approximately Q3 – Q4, 2017.